If you want to pay for your lessons as you take them, this is the option for you. I recommend doing at least 2 hours at a time. This way you will be able to develop your skills faster & retain more knowledge than if you only did 1 hour per week. It will also enable you to reach test standard sooner and therefore reduce the cost of learning to drive. Got good car control skills? Need less than 25 hours training? An Intensive Course would be the best option for you. Your Aim is probably to pass your test as soon as possible, so with this in mind I would recommend taking an Intensive Course. This will considerably reduce the time & overall cost of learning to drive & you could have your Licence within a Week! The courses I run are individually tailored to suit your needs, therefore they are flexible and do not need to be taken all in one block but generally they consist of 5 hours per day practical training and your test would be booked for the last day of training. My Success rate for these Courses is around 80-90% First Time Pass which is double the National Average. Learning to Drive has become an essential “Life Skill” which is challenging but also rewarding and enjoyable. My standards are Very High & I will make sure that you well equipped with Knowledge & Skills which will enable you to be a Confident & Safe Driver for the rest of your life. 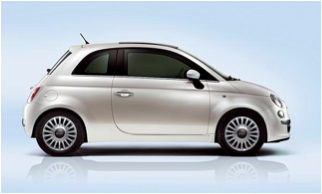 You will be learning in a Fiat 500. An Iconic car with Retro Styling it's the perfect car to learn to drive in, easy to handle & manoeuvre with a real "Fun Factor" feel to it. Your Aim is probably to pass your test as soon as possible, so with this in mind I would recommend taking an Intensive Course. This will considerably reduce the time & overall cost of learning to drive & you could have your Licence within a Week! However, for those who don’t have the time to do an Intensive Course or would rather take weekly lessons, I recommend doing at least 2 hours at a time. This way you will be able to develop your skills faster & retain more knowledge than if you only did 1 hour per week. It will also enable you to reach test standard sooner and therefore reduce the cost of learning to drive. The courses I run are individually tailored to suit your needs, therefore they are flexible and do not need to be taken all in one block but generally they consist of 6 hours per day practical training and your test would be booked for the last day of training. My Success rate for these Courses is around 80-90% First Time Pass which is double the National Average. At what age can I start learning to drive? As long as you have your Provisional Licence (which you can apply for 3 months before you are 17) you can begin practical driving lessons on your 17th Birthday. Do I need to pass my Theory Test before I can take lessons? No, you can take lessons while you are studying for your Theory. How soon can I book my Practical Test? You must have passed your Theory Test before you can book a Practical Test. Will I be taking my Test in the area where I have taken the course? Yes, I would always book the test and teach you around that area, which would usually be the Town where you live. Do I take the Test in your car? How do I know what length of course to book? The table below will give you a guide but I would strongly recommend taking an assessment so that I can help you make the correct decision. This Table is ONLY A GUIDE, you must be honest with yourself and me when you book a course and make sure it suits your current ability. Important things to know before booking a course with anyone. It would be unwise to base your decision on finding the cheapest price when booking a course. A cheap price usually means you will not be getting 1-1 training and you may be spending time in a classroom instead of driving a car. Here are some questions you should ask when choosing a Course. How many hours actual driving will I do per day? You may be told that you will have 6 hours tuition per day but some of this time may be spent in a classroom or on breaks. Is the Instructor a Trainee or Fully Qualified? Before an Instructor has passed their final exam of competence to teach, they are allowed to teach pupils on a “Trainee Licence”, many schools use Trainee Instructors to keep the costs down. What Grade is The Instructor? & ask to see proof. Every Qualified Instructor has a regular “Standards Check” by the DSA and they must achieve Grade A or B or to continue to teach, Grade A is the Top Grade. As it would be easy to tell you they were Grade A, it would be advisable to ask to see proof in the form of their last Standards Check marking form. What is the Instructor’s 1st time pass rate? This is a good question to ask but difficult for you to know if you have been given a truthful answer as unquestionable proof is not available, however the National Average is around 30-40%, if someone tells you 100% that either means they are not telling the truth, have only recently qualified and only taken a few pupils for test & they all passed or they are basing the figures on a short period of time, e.g. 1 month. Make sure the car will be suitable for you, for example a very small car may not give enough leg room for a very tall person, I have known of people booking courses and not being able to fit into the car so they were told they could not take the course and could not have a refund. Will I be picked up from home or do I have to come to you? Many courses are run from central locations which you have to travel to and from, quite often Blackpool, this makes a 6 hour driving day Very long which makes it inconvenient and adds to the cost. Will my test be booked before I start the course for the last day of my training? Some companies only book your test after you have started the course so that they assess you first and only book your test if they think you are going to have a chance of passing it, if you do not reach the standard you will not be allowed to take a test and will need to book more tuition at a later date. Will the test be in the area when I have been taught? If they do decide to book you a test they will only be able to get a short notice cancellation which could mean you have to take the test anywhere in the UK, this means your Instructor may have to drive you over 100 miles to get to the Test centre on the day of your Test which uses up your valuable tuition time and gives you the added pressure of taking a Test in a totally unfamiliar area. Finding out these Facts is the only way you can compare courses and prices. The Training and Courses I offer are Top Quality, and as most of my clients pass their test First Time, are Very Good Value for Money.